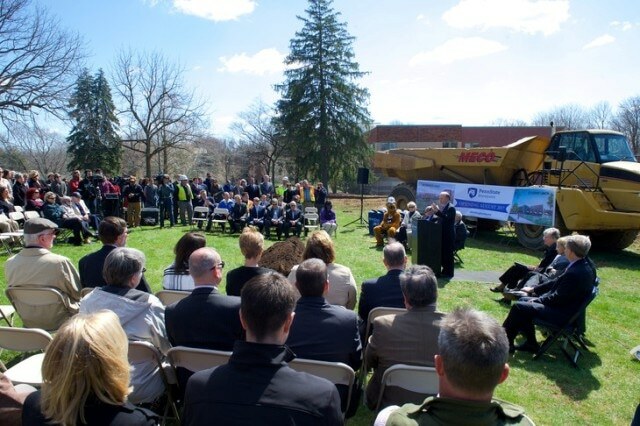 Penn State Brandywine held a groundbreaking ceremony on March 29 to kick off construction of the campus’s first residence hall and a new student union building. Jerry Parsons, chairman of Brandywine’s advisory board and among the first students to attend classes at the current campus location, speaks to attendees during Penn State Brandywine's Groundbreaking Ceremony. Credit:Image: Mel Epps, Third Eye Productions, Inc. The two new buildings are scheduled to open in August 2017. The residence hall will house 254 students and the student union building will include a dining hall, conference space, student recreation areas, the campus bookstore and student affairs offices. “These new buildings will transform our campus, and they will transform the educational experience for all of our students, whether they live on campus, off campus or commute from home,” Penn State Brandywine Chancellor Kristin Woolever said. Woolever said 2017 will be a milestone year for the campus, with both the opening of the new buildings and the celebration of the campus’ 50th anniversary. Madlyn Hanes, vice president for Commonwealth Campuses, noted that she began her Penn State career as Brandywine’s director of academic affairs. Jerry Parsons, chairman of Brandywine’s advisory board and among the first students to attend classes at the current campus location, said the buildings will bring new opportunities for students. Olivia Shiner, president of Brandywine’s student government association, said the new buildings will create a more vibrant campus. State Rep. Tom Killion, who attended classes at Brandywine in the mid-1970s and formerly served on the campus advisory board, commented on the growth over time. Also participating in the groundbreaking ceremony were: Gail Hurley, associate vice president for auxiliary and business services; John Tierney, chairman of the Brandywine Faculty Senate; Mario Civera, chairman of the Delaware County Council, and Christopher Quinn, a member of the Middletown Township Council. Penn State Brandywine is located on 112 acres in Middletown Township, Delaware County, with an enrollment of about 1,500 students. The campus offers two associate degrees, 12 baccalaureate degrees, and the first two years of more than 150 additional baccalaureate degrees that can be completed at another Penn State campus.